Wooo Wooooooooo… The Tardy Train is coming through! My B for making this little weekly shindig happen at lunchtime rather than with your 8th cup of coffee as is usual. 1. The Lakers have pulled ahead to 2-0 in the NBA Finals. The Magic have to turn it on or else no one, and I mean NO ONE, on ESPN will ever shut up about how awesome Kobe is. 2. Summer Bird upset Mine that Bird and Calvin Borel to win the Belmont on Saturday. Didn’t really watch it so I can’t give any first-hand reactions to it, but from what I saw of the people who did watch it, it was rather uninteresting and no one cared. I guess that’s what happens to a race when it proves to be meaningless and the sport relies upon meaningful races to draw a crowd other than degenerate gamblers. 3. The Penguins got housed on Saturday, losing 5-0 to the Red Wings. Detroit leads the series 3-2, and outlook is dismal for people in Carnegie’s City. Prepare for either crying, complaining and whining from CGally, or obnoxious “we are the champions” chants, cheers, and posts in the coming days. 4. 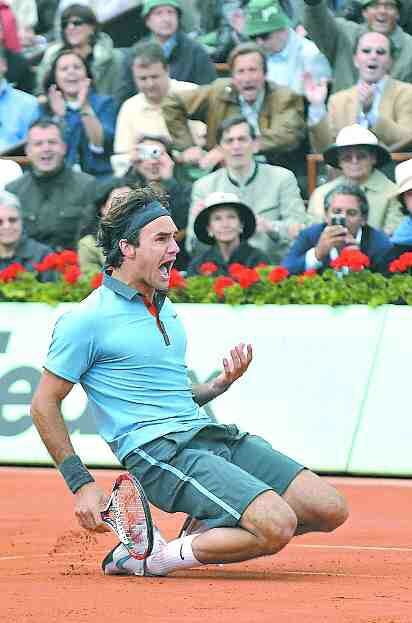 Roger Federer beat some guy in the finals of the French Open to win the last major he needed to complete the cycle. Now that this guy is probably considered the best tennis player ever, or at least top 3, you would think he would be able to pull some crazy hot tail. Au contraire. Now, I’m not saying she isn’t an attractive woman, and I’m sure she has a great personality, but this is hardly even registers on the WAG meter, and as said before, Federer is pretty much the greatest tennis player alive or dead. Just sayin’. 5. Last night, the Padres played (technically) a game against the D-Backs. I say technically because they ended up playing 18 innings, the last nine of which (i.e. a whole regulation length game) the D-Backs bullpen made the Padres go hitless. Yes, a 9-inning relief pitching no-hitter. And other than the last pitcher to go getting the win, there really is no stat that will sum up that amazing performance. Kind of a shame. Just finished my chicken parm sandwich for lunch. Don’t act like you’re not jealous. It was delicious. You are currently browsing the archives for the Roger Federer category.